It's been another record-breaking year at the EU Intellectual Property Office (EUIPO), with filings at an all-time high. 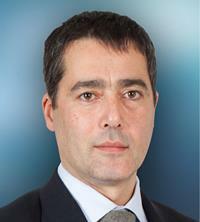 In an exclusive guest post, Robert Reading from CompuMark reveals the top corporate filers at the EUIPO in 2018 and looks at some of the key trends from the registry in the past 12 months. As director of custom & managed solutions at CompuMark, Reading is an expert at analysing trademark data from IP offices around the world. Below, he looks at the leading filers from last year, and explains why Chinese applicants to the EU often take a very different approach than applicants from other countries. As measured by data from the World Bank, the European Union is the second largest consumer market in the world, behind only the United States and well ahead of China and Japan in terms of consumer spending. Unsurprisingly, then, this makes the EUIPO one of the key trademark registers for brand owners. 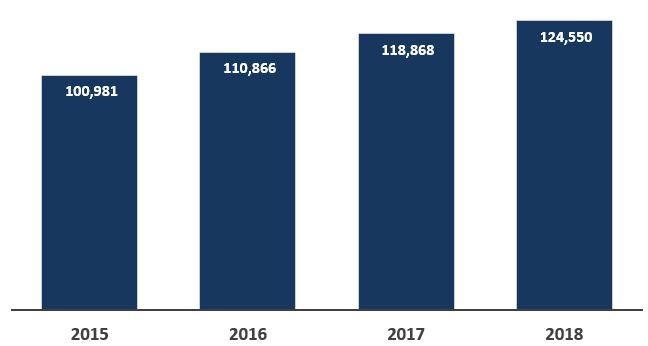 It is for this reason, perhaps, that 2018 was yet another record year for trademark applications at the EUIPO, with nearly 125,000 EU trademark (EUTM) applications received in the 12 month period. While growth was not necessarily as high as recent years, filing volume still grew by nearly 5% compared with 2017. When it comes to the leading applicants at the EUIPO, previous years have always been dominated by the world’s largest and most recognisable brands. However, as the list of the top 50 EUTM applicants reveals below, data from 2018 suggests that this long-running trend may be changing. As the list reveals, cosmetics giant L’Oreal was the leading filer of EUTMs in 2018, with 253 EUTM applications across the year. Chinese technology company Huawei was second with 244 applications, followed by another technology company, Samsung Electronics, with 178 applications. These three conglomerates have featured regularly among the top EUTM filers in recent years, but some firms made a first appearance; Zitro IP from Luxembourg, for example, has not featured in the top 100 applicants previously, while Design Works Studios had not filed a single EUTM prior to 2018. Interestingly, while also appearing highly in the list, Samsung Electronics took an unusual approach to its EUTMs in 2018 by using 11 separate law firms to file its applications to the EUIPO. Other companies, including Huawei (which used three law firms), LG Electronics (three), Mercadona (three) and Guangdong Oppo Mobile (six) also split their EUTM filing work between multiple law firms. Curiously, many major brands that have featured in the top 50 EUTM applicants previously do not make an appearance in the 2018 list, although some do feature in the top 100. They include Apple, Skechers (joint 52nd place), Lidl, Merck (joint 58th), Merck (62nd), World Wrestling Entertainment, Daimler, Robert Bosch (joint 65th), Baidu, Alibaba, Mars and E.I. Dupont (joint 73rd), Target Brands and Pepsico (=80th). In terms of the leading individual applicant, Marina Eduardovna Amaffi led the ranking by filing 46 EUTM applications in 2018 for fragrances, mostly featuring ornate designs for perfume bottles. The website 'amaffi.com' is currently a holding page stating “coming soon”, so perhaps Europe is about to see a new range of luxury fragrances from Russia? Another interesting new entry for 2018 was Aphria Inc from Canada. Its entrance on to the list is the first time a company from the cannabis sector has made the top 50 (with 43 EUTM applications in total) and could be a sign of things to come if the experience of the Canadian trademark register is any guide. However, cannabis-related trademark applications have a high failure rate in Canada, although none of Aphria’s applications at the EUIPO have reached the registration stage so far. Outside of specific filers, traditional industry sectors continued to dominate the filing landscape in 2018, with pharmaceutical (six applicants in the ranking), cosmetics (four), agrochemicals (three), consumer goods (three) and tobacco (three) companies together taking 19 of the top 50 positions. The appearance of three casino gaming companies in the top 10 of the rankings list, and five in the top 50, suggests an industry sector that is both growing in size and that values constant innovation (and therefore new trademark applications) to keep their product “fresh”. When it comes to the countries where these leading applicant originate from, the United States and Germany were the leading filers within the top 50, with companies from these two countries making up 40% of the list. 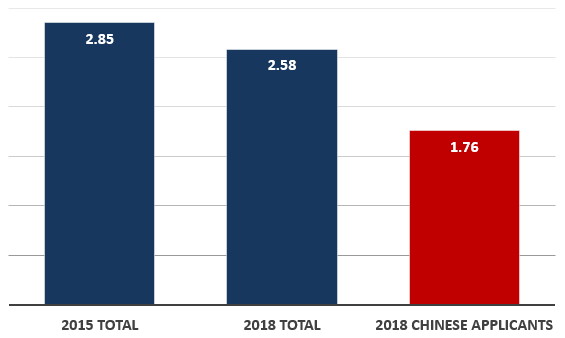 Although in 2018 EUTM applications from China (12,019) exceeded applications from the USA (11,395), Chinese applicants tended to be file low numbers of applications individually but with a large number of different applicants. Therefore, there were only two Chinese companies in the top 50 list (plus Tencent, which filed trademarks using an entity in the Cayman Islands). However, one area in which Chinese applicants did dominate the EUIPO register in 2018 was success rate. EUTM applications from China had a very high registration level (7,852 applications have been accepted for registration) compared with the refusal/withdrawal level (only 98 applications out of 12,019 filed in 2018 by Chinese applicants have been rejected or withdrawn). Therefore, Chinese applicants achieved 80 registrations for each unsuccessful application. On the other hand, US applicants achieved 17 registrations per failed application, while German applicants matched the overall register average of 15 registrations for each failed application. While these startling figures initially suggests that Chinese applicants have a level of trademark filing knowledge above those from the USA and Germany, the reality appears to be more mundane. Specifically, EUTM applications filed by Chinese applicants tend to be extremely unusual by Western standards, and therefore less likely to be considered descriptive or to clash with existing marks. It isn't just success rate where Chinese applicants to the EU differ from other applicants, as they also take a different approach when it comes to the number of classes they file in. Prior to March 2016, an EUTM application could cover up to three Nice classes for a single filing fee. The reason for this is because there was effectively no cost for adding a second and third class to an application, so applicants typically filed in three classes (the average number of classes for an EUTM application filed in 2015 was 2.85). In March 2016, the EUIPO introduced a new pricing structure with fees being payable for each class included in the application. This has had a surprisingly small impact in the average number of classes when look at total applicants, with the 2018 average falling by only 10% to 2.58. However, for Chinese applicants in 2018 the average number of Nice classes in an application was only 1.76, suggesting that Chinese applicants tend to be particularly cost conscious. Looking at individual classes on the EUIPO trademark register, class 9 (technology) and class 35 (retail services) were the most frequently used Nice classes in 2018, with each appearing in approximately 10% of all applications. Furthermore, classes 42 (computer software), 41 (entertainment) and 25 (clothing) completed the top five. However, for Chinese applicants the pattern was very different – over 22% of all Chinese applicants filed in Class 9, with Classes 25, 11 (home appliances), 21 (household utensils) and 28 (toys) next in importance.